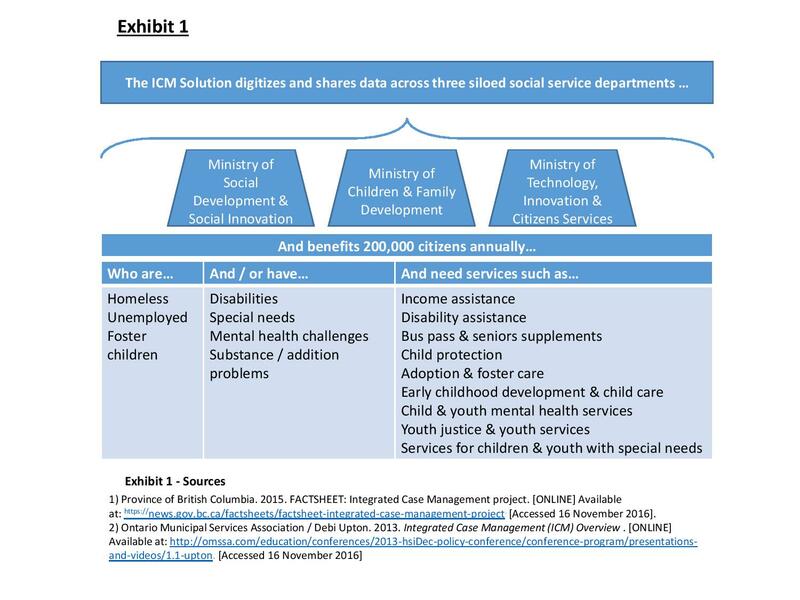 British Columbia, a province in Canada, spent five years and $182M on the Integrated Case Management (ICM) digital transformation to enable social service ministries to see a more holistic view of citizens and provide better social services. Was the ICM transformation worth the price tag? Issue: Social services are split across three siloed ministries. Citizens with complex needs had to visit multiple ministries to receive benefits. Ministries stored information across 50 different 30-year-old systems as well as paper files. Each ministry only had information for their own area, so there was no holistic view of a citizen. Digital Solution: Over five years, a customer relationship management (CRM) software solution was implemented to digitize social services, share information across ministries, and provide better service to citizens. ICM helps get “the right information to the right people at the right time, in a secure manner that protects privacy, to improve outcomes for citizens through the cohesive delivery of social services.” Today, citizens spend less time filling out forms and receive quicker service. Because data is shared, case workers have a more complete picture of the citizen and their situation and evaluate citizens holistically. The purpose of case management is to “develop an ongoing relationship with the patient” and studies have shown that this method has led to “improved occupational functioning, less social isolation and more independent living.” A case worker can check a citizen’s welfare status, employment assistance services, any citations of domestic abuse etc. This is characterized as “citizen-centered service delivery” which focuses on individual needs instead of Ministry-specific services. To improve delivery of social service programs “outdated and inflexible information systems” were replaced which changed the way 9,000 staff did their jobs. Prior to ICM, administrative activities took away time from direct service delivery and staff couldn’t access appropriate information needed about the citizen. ICM brought a wave of changes – better tools for front‐line workers, coordinated planning, case management, consistent service standards, information sharing across ministries, enhanced reporting and streamlined administration for service providers. ICM introduced consolidated citizen data (single source for data), policy automation / eligibility determination (rules built into system rather than relying on policy manuals) as well as electronic document management (allows access to information independent of geography). While these are not groundbreaking digital technologies in sectors like retail for government this is a big step forward. Training and change management needed to digitize the workforce has proved difficult. This was a fundamental shift in 30-year old standard operating procedures. An ICM executive noted issues with “level of comfort with technology in general.” This ballooned in the media. One newspaper called ICM a “colossal failure,” and another cited grievance from social workers, “data routinely disappeared, and the system was extremely cumbersome to use.” As with all implementations there is an initial learning curve and fine tuning needed. I’m sure everyone in the RC class has experienced similar roadblocks teaching their parents how to use technology properly. Others question data integrity. One article warned, “Can you imagine if every bit of information every Ministry in BC has on you was in one place? It would be the single biggest target in the province.” To researchers, this is a non-issue as there is encryption technology to adequately protect confidentiality. To me, storing information about citizens in different places is inefficient like a squirrel burying acorns in a field when the squirrel bury all acorns in a secure shed instead. Changes to business and operating model may win back the public and continue to deliver quality social service to BC citizens. But is it worth the extra cash? Goering, P.N., Wasylenki, D.A., Lancee, W.J., Farkas, M. and Ballantyne, R., 1988. 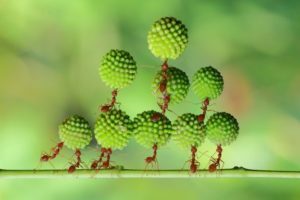 What difference does case management make?. Psychiatric Services, 39(3), pp.272-276. Province of British Columbia. 2013. Personal Information and Integrated Case Management. [ONLINE] Available at: http://www2.gov.bc.ca/assets/gov/british-columbians-our-governments/organizational-structure/ministries-organizations/social-development-social-innovation/icm-information.pdf. [Accessed 16 November 2016]. Province of British Columbia. 2015. FACTSHEET: Integrated Case Management project. [ONLINE] Available at: https://news.gov.bc.ca/factsheets/factsheet-integrated-case-management-project. [Accessed 16 November 2016]. Times Columnist / Lindsay Kines . 2013. Children’s watchdog says computer system for social workers a “colossal failure” – See more at: http://www.timescolonist.com/news/local/children-s-watchdog-says-computer-system-for-social-workers-a-colossal-failure-1.56291#sthash.yRzMYO2q.dpuf. [ONLINE] Available at: http://www.timescolonist.com/news/local/children-s-watchdog-says-computer-system-for-social-workers-a-colossal-failure-1.56291. [Accessed 16 November 2016]. Institute of Electrical and Electronics Engineers. 2014. British Columbia’s Integrated Case Management System Falls Over. [ONLINE] Available at: http://spectrum.ieee.org/riskfactor/computing/it/british-columbias-integrated-case-management-system-falls-over. [Accessed 16 November 2016]. PrivaSecTech. 2013. Integrated Case Management. [ONLINE] Available at: https://privasectech.com/integrated-case-management/. [Accessed 16 November 2016]. Reamer, F.G., 2013. Social work in a digital age: Ethical and risk management challenges. Social work, p.swt003. Indo-Canadian Voice Newspaper / Rattan Mall. 2015. $182-million Integrated Case Management System has not fulfilled its key objectives: Auditor General. [ONLINE] Available at: http://www.voiceonline.com/182-million-integrated-case-management-system-has-not-fulfilled-its-key-objectives-auditor-general/. [Accessed 16 November 2016]. Zur, O., 2012. TelePsychology or TeleMentalHealth in the digital age: The future is here. California Psychologist, 45(1), pp.13-15. Barak, A. and Grohol, J.M., 2011. Current and future trends in internet-supported mental health interventions. Journal of Technology in Human Services, 29(3), pp.155-196. One of the most common critiques to public institutions around the world is their failure to adopt more efficient and accurate technologies, despite the fact that private companies have been using them successfully for years. I personally find it unacceptable to have critical public institutions rely on paper documents to operate and make decisions, especially in a first-world and wealthy country. I can only imagine the time waste of having employees search for paper records, as well as the many mistakes that lack of integrated systems can generate: false records, double-payments to the same person, and even non-payments to citizens that were entitled to a service. I do see, however, your concern in change management. Even with general consensus that a public institution needs to go digital, these organizations have tremendous resistance to change and inertia. How can citizens and governments make sure that their institutions change their operating model towards a digital one? McKinsey’s approach to change management lays four pre-conditions to change mindsets and behaviors that could be applied to British Columbia’s Social Services. First, public employees need to have a purpose to believe in. They need to understand why the new system is needed, what is the benefit for citizens of such a change, and what is in there for them. Second, we need to ensure that companies have the skill-sets needed for change. How can we ask a public employee to use a digital system if they can’t use a PC? As you mentioned, teaching technology to non-experts can be pretty daunting. But it can also be done. And even if it’s impossible to change some, maybe is time to think about renewing the workforce with people more apt to the challenges of today? Third, employees need consistent role models. British Colombia needs everybody in the chain of command, from the most senior politician to middle managers, adopt the new technologies and share their example with their colleagues. Finally, formal reinforcement systems need to be put in place. For example, British Columbia could establish payment incentives to employees that successfully go digital. Promotions and layoffs could also be tied to minimum digital competency and usage levels. Also, statistics of digitization and costs savings could be published regularly for the general public to scrutinize. In short, it seems like British Columbia is going in the right direction, but they need to double-down in change management to realize the increases in efficiency and accuracy of its systems. Thanks for the fantastic post, EBN! I spent a few months advising a federal agency that wanted to identify an approach to automatically enroll Medicaid eligible school children into their free and reduced lunch school programs, and the single largest barrier we encountered was variability in how states collected and stored data. I remember having one school district send me scanned, handwritten documents that contained lunch eligibility for 30,000 students in her district. So, I think that the work of the Canadian government is commendable. Data security does seem to be of grave concern. Even the best data encryption may not prevent employees from sending one another unsecured files with citizen personally identifiable information. Even the most trusted firms in the US fall victim to this, and the US government accounts for their foibles here: https://ocrportal.hhs.gov/ocr/breach/breach_report.jsf. Quick question: what did you mean when you noted that the UX should be modified to “behave like a consumer-grade application”? How would this work? Jacqueline – Agreed, it’s crazy how so many institutions still rely on paper! Happy to clarify what I mean for UX bringing consumer grade experiences to the enterprise. If you think of consumer technology, they’re usually pretty intuitive (iphones are a great example… or even turbo tax for something more complex). You don’t need much training on how they work, the experience is intuitive. I think the BC government is one of many organizations that could benefit from thinking how do they make technology for work as intuitive and easy to use as technology we use in our everyday lives. Very cool to see that British Columbia has built an integrated case management system across its social services. We are still a long way off from an integrated system in the United States, but even small integration has had some significant benefits. For example, one of the biggest challenges for getting citizens access to benefits is establishing eligibility – but for many of our social safety net programs, the eligibility criteria are the same or highly similar. 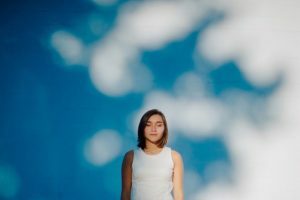 Some Federal agencies have begun sharing eligibility lists to help identify citizens who could benefit from additional services – and to automatically qualify those citizens to receive services rather than forcing them to go through a second application process. Let’s hope that in the future we can follow British Columbia’s example. Unless there was a significant failure in delivery of these services, it seems extremely difficult to believe that the investment shouldn’t have happened. However, perhaps what could have been different is to set the expectations differently. As many will have seen, it is rare for a shift to digital to go perfectly smoothly. This potentially could have been better communicated to the public in advance, and is a lesson for all public and private organisations to be aware of before embarking on a digital transformation. It was really interesting to hear about the work that has taken place in British Columbia to digitize case management. I know that in the UK there has recently been a shift in the health and social care sectors towards person-centred planning for public service users, and integrated case management. However, while some progress has been made, the stumbling blocks that you mentioned for ICM in Canada have also emerged in the UK: the level of familiarity with technology use is often low, and the confidentiality requirements in the NHS and social care systems are high so it is complicated for them to share service user data even among departments within the same health service or council. Progress is gradually being made but in the meantime, it results in large inefficiencies and extensive frustration for service users who have to repeat and re-enter the same information about themselves each time they interact with a different government department.